It's getting hotter (and then colder...then hotter...) down at the West Brunswick Community Garden and so is our compost. We've got a 5-bay composting system, with each bay holding about 1/2 a cubic metres of organic matter in various stages of decomposition. Generally there is an array of information about how to compost out there, its even provided by the local council. But what about the why of compost? Assist the earth. I don't want to sound preachy, but did you know it takes 1000 years for the earth to create 1 inch of top soil? Composting helps the earth (at least in your garden, your neighbours garden or your community garden - whomever is benefiting from some happy nitrogen-carbon balance break-down) produce more of the good stuff, and that, in turn, helps the plants grow, the bee hum and the birds trill in the whole natural cycle of things. Diverts green waste from your rubbish bin. This is a great point from even those who have the anathema of green thumbs. Even if you do not have a garden, having a compost bin will leave more space in your rubbish bin for, well, rubbish, or just space. 1. It means that there will be a whole lot less methane produced from green waste rotting in an unbridled way in rubbish tips across the city. This is a great benefit to the environment and limiting climate change. Therefore, composting is one of the little things that you can do for the environment that have a great impact in the long term, along with changing you light bulbs and shower-heads to energy/water saving versions. 2. Less waste in your rubbish bin may end up with you being able to live with smaller rubbish bin all together. In the city of Moreland, downsizing your bin from a 120L to a 80L can save you money on your annual waste collection rates. You can contact the council for more info. An eye-full of the good stuff! 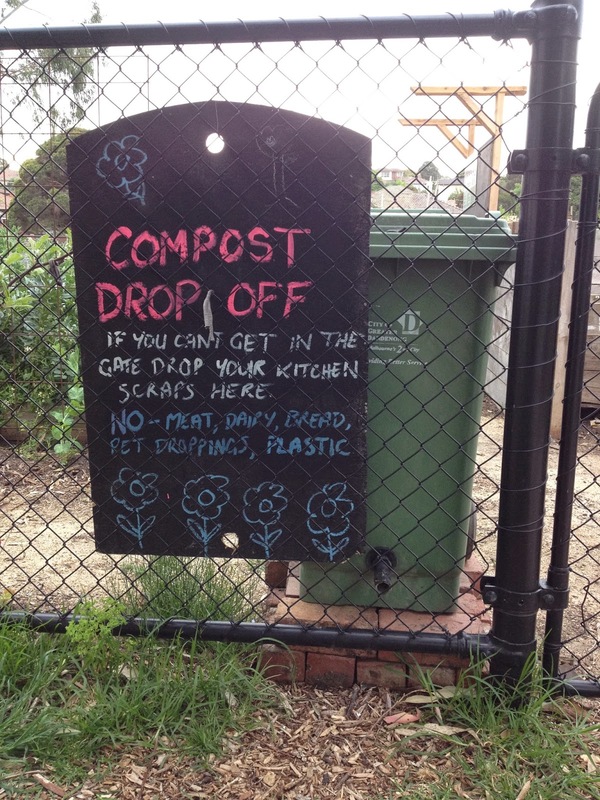 If you don't have room for a compost bin in your backyard, or lack a backyard entirely, yet still want to compost, feel free to bring it down to the WBCG. We have recently set up a bin near the gate for people to make a deposit. From then on in it's over to all of our gardeners to share in making the alchemy happen, lead by our Compost King, Thomas.